End of March, Rob Jaartsveld and Mariëlle Meuffels gave a masterclass on the topic: “From a product to a more services oriented business”. 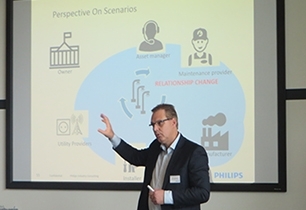 This masterclass, organized by Industry consulting, one of the key areas of expertise of Philips Innovation Services, gave an introduction to the challenges of transforming from a pure product to a more services oriented business. In their presentation, Innovation consultants, Rob and Mariëlle focused on the impact of the transformation on business ecosystems, business models and the business case. A shift from being product based to being outcome based, allowing different business models. Total cost of ownership of assets is often carried by the service providing firm. More about our service Innovation for growth of our key area of Industry consulting expertise. Did you miss this masterclass and want to get more knowledge on this topic or want to know what Philips Innovation Services can do for your business? Contact our Innovation consultants Rob Jaartsveld or Mariëlle Meuffels.